Adorable in size and perfect for him to cuddle with at nap time or anytime in between. Make this Embroidered Blue Elephant a great gift that comes from the heart on any special occasion. 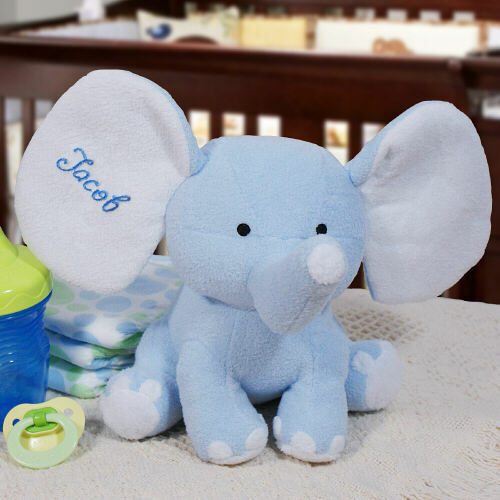 Personalized Baby Gifts like this stuffed elephant may feature any name embroidered in the right ear to make a keepsake he'll love for years to com. Our Plush Elephant features soft, stitched eyes and is a light blue color with white on the inside of her ears, tip of her nose and bottom of his feet. I absolutely love this product. Not only is it precious it is well made and so soft. Will definitely order another one next baby. I absolutely loved this adorable elephant. I purchased it for a baby shower gift. The personalization of the recipient’s name makes it even more special. Love this product and every recipient has loved this item . It’s quality material ! Additional Details GiftsforYouNow.com offers a wide variety of Personalized Baby Gifts. Our Personalized Baby Gifts are perfect for baby showers, birthdays or any gift giving occasion. Each gift that you choose will become a treasured gift enjoyed for years and years. Be sure to also view our larger Embroidered Blue Polka Dotted Elephant. We also carry this version of elephant for Girls! Please view our Embroidered Pink Plush Elephant as well.